Kind-hearted. Dedicated. Behind the scenes champion. These are some of the words that have been used to describe Office Manager Mary Kay Marshall, who celebrated her twenty-year anniversary with Bartlesville Regional United Way this year. Mary Kay is retiring this December, leaving behind a long legacy of commitment to the mission of the United Way. "Mary Kay has been an amazing asset to Bartlesville Regional United Way," BRUW President and CEO Lisa Cary said. "In the past 20 years, she has steadied the ship on more than one occasion. When I first arrived as the President and CEO, Mary Kay made me feel right at home and helped me learn the ropes. Her kindness and dedication will be a forever legacy at BRUW! I will miss her smiling face at the office." Mary Kay started in September of 1997, and her first day was the annual campaign kickoff. She dove right in, helping the executive director, who was then Marguerite Arnold, have a successful kickoff. Arnold had been struggling to find someone who would stay in the position very long, so when she hired Mary Kay, she told her she was looking for someone who would stay a while. Little did she know how successful she would be! Marguerite and Mary Kay worked together in the old Will Rogers School building, with Marguerite in the old principal's office and Mary Kay in the old secretary's office. One of the most fun fundraisers Mary Kay remembers was during those years: Mud volleyball. 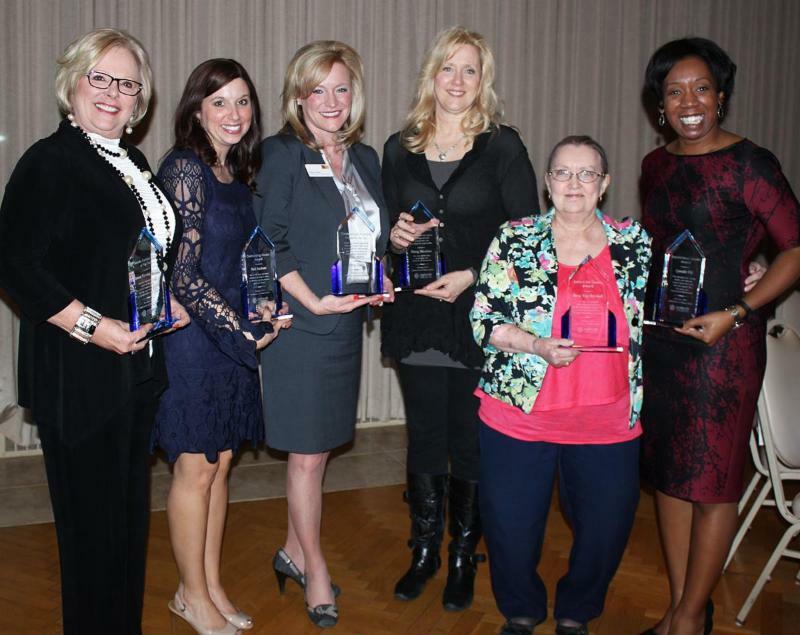 Mary Kay, second from the right, poses with her Behind the Scenes Award at the Third Annual Women in Business Banquet in Feb. 2016. "We had it out in the industrial park by ABB and the fire department came out and hosed down the dirt to make one giant mud puddle," Mary Kay said. "We only had it two years, then it changed to regular volleyball. I think everyone decided it was too messy!" Not everything went as planned, but they improvised and carried on. Mary Kay remembers a kickoff which they were hosting outdoors at the Bartlesville Community Center parking lot using a flatbed trailer as a stage. Unfortunately, it started to pour in the middle of the program. "We had to pack everything up and run to the Boy Scouts office (then housed across the street) to finish! We were all crammed into a little tiny building," Mary Kay says. One event that stands out for Mary Kay was a Day of Caring kickoff when Thad Satterfield was the executive director and Andria McCullough was the campaign manager. The United Way staff and volunteers put up the beginnings of a house for Habitat for Humanity. Andria has fond memories of those years at United Way. "Mary Kay is such a blessing to this community, one that so many would never even realize, as she works tirelessly on their behalf. With a servant's heart, she is so quietly behind the scenes ensuring that donations are accounted for so that the agencies the United Way serves have everything they need to be even greater organizations, providing even greater services. So many people in need here at home have benefited from efforts that she would never take credit for, yet such important work which has such tremendous impact." Mary Kay remembers that time as being a busy time for United Way, as the staff launched a 211 helpline that would direct people on ways to find assistance. It was housed in the Bartlesville office for a little over three years, before it combined with the Tulsa Branch. Both Mary Kay and Andria have fond memories of working together. "During my time as at the United Way and as an agency director, there was such comfort in knowing that Mary Kay was in my corner, supporting my efforts, both professionally and personally. She was a cheerleader, a mentor, a confidant, on so many occasions. I have always been truly blessed by her loving spirit and her nurturing heart. She helped me remember to be thankful, no matter where life takes me. So many have been touched by Mary Kay in unknowing ways, but her touch in my life will forever leave an imprint of thanksgiving!" Mary Kay has lived through a lot of staff transitions. The next team - her, Marice Wasemiller and Meredith LeMaster- had a lot of fun together, Mary Kay remembers. "Mary Kay has been a great keeper of knowledge for so many, especially when you are new to the community and a new career," former campaign manager Marice Wasemiller said. "I appreciated Meredith LeMaster's and Mary Kay's guidance when I moved here. Mary Kay was always looking out for you on a personal level. Her heart was full of love for everyone. I have so many fond memories of Mary Kay that will stay with me." In more recent years, Mary Kay has enjoyed seeing the United Way campaign grow and take on new projects, including initiatives. "We're branching out more and doing more in the community," she said. Through all of these traditions, Mary Kay has been the constant presence who quietly and without fanfare made sure the work of United Way continued to get done, regardless of what else was going on in the office. And she has received well-deserved recognition for it. She was honored with the Behind the Scenes Award in Feb. 2016 at the Women in Business Gala, and received an award for 20 years of service at the United Way Annual Meeting in May. Abigail Singrey, who has worked at United Way for the past five years, says, "Mary Kay truly brightens every day at the United Way office. Her constant cheerful presence and dedication to the mission of United Way have made our office so much stronger. She inspires me every day by the strength of her commitment to United Way." Mary Kay has enjoyed reflecting back on the past twenty years. Through multiple building moves and staffing changes, she has been there to help take care of the United Way's donors and partner agencies. She gets emotional when she thinks about leaving, but has decided that it's time to spend more time with her grandchildren. Still, it's hard to let go of the place that has held her heart for the past twenty years. "The best part has been knowing that you helped the agencies that give the direct assistance and touched many lives that you couldn't personally do," Mary Kay said. Save the date for Mary Kay's retirement party! It will be held on Dec. 5 from 3-5 p.m. at the United Way office. We'd love to see anyone who would like to come out and help us honor her.